Are you 18-30ish, living in the Waikato, and ready to shake up young culture? Seed Waikato events create a space for you to meet young people, and hear stories, tips, and hacks from local leaders! Enjoy some nourishing nibbles from Hearth Grocer, a facilitated session, and three local speakers sharing glorious insights. Parekawhia has been with the Transport Agency since September 2016 after five and a half years as the Chief Executive Officer of Waikato-Tainui. Parekawhia has more than 15 years of public policy and public sector management experience including being an advisor to three Prime Ministers whilst at DPMC. Additionally for 7 years she was director of her own company dedicated to advancing the creative potential of Māori knowledge, people and resources. She brings significant stakeholder management and governance experience to the Transport Agency. 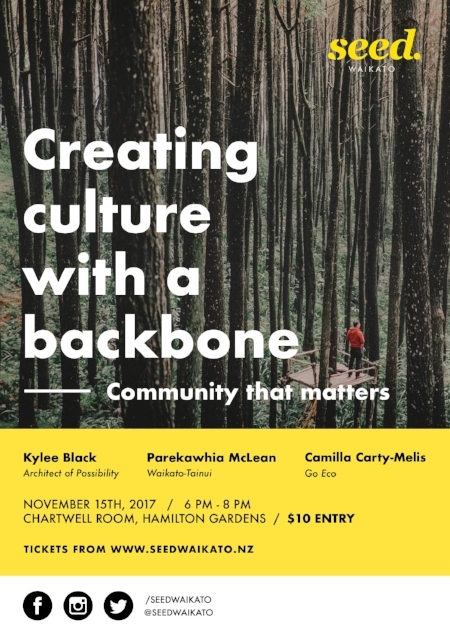 Parekawhia is a member of the Waikato Means Business forum, a Director of Sports Waikato, the National Science Resilience Challenge and a Trustee of the Momentum Philanthropic Foundation. Parekawhia has Masters’ degrees in Social Sciences from the University of Waikato and in Public Administration and Development Policy from the University of Wisconsin. In 2014, she received a Distinguished Alumni Award from the University of Waikato for public policy and business. Kylee is a social entrepreneur who is committed to cultivating community and enabling the best in others. In 2009, Kylee founded the not-for-profit Spirit Sparkplugs in order to mobilise community awareness and support of young people with rare disease. Volunteers made items for over 1200 care and encouragement packages, which were sent to nine different countries. Kylee identified a need in this area through her own journey with rare disease and, in 2011, she received an International Heart of Gold award for her contributions. In 2016, Kylee shared her own story in a video for Enabling Good Lives, which became a catalyst for building the platform she has today. Kylee takes every opportunity to use this platform to speak out about important issues facing our society. Kylee now runs her own speaking and consultancy business and is currently involved in projects with MyCare, the Ministry of Health, and the Ministry of Social Development. As an established public speaker, Kylee has addressed a variety of people within different settings, including parliament, national and international conferences, and a range of local events. Kylee’s goal is to see young people encouraged and supported in redefining their own circumstances, challenging perceptions of how we view others and ourselves, and enabled to live the best life that they can. Camilla developed an interest in nature in her early childhood, and spent her teenage years pressuring her friends and family to recycle, sign petitions, and donate their time and money to conservation projects. She went on to complete first class Bachelor and Masters Degrees in Environmental Sustainability, focusing on education and community engagement. Now, Camilla spends her time working with businesses, organisations, councils, schools, and other groups who wish to incorporate environmental and social values in to how they do things, and helps them progress on a journey towards greater sustainability. When she is not at work, she is volunteering for causes she cares about, including The Serve Trust, Sustainable Business Network, Para Kore, IHC, and with the Red Cross as a refugee resettlement volunteer. She also helps run an after-school programme that gets kids involved in their local community – ask her about it if you’d like to know more! A huge thank-you to Jessie Michels for designing this poster! A special thank you to Sam Wright, who created this highlights reel from our September event, so you can get a taste of the vibe!